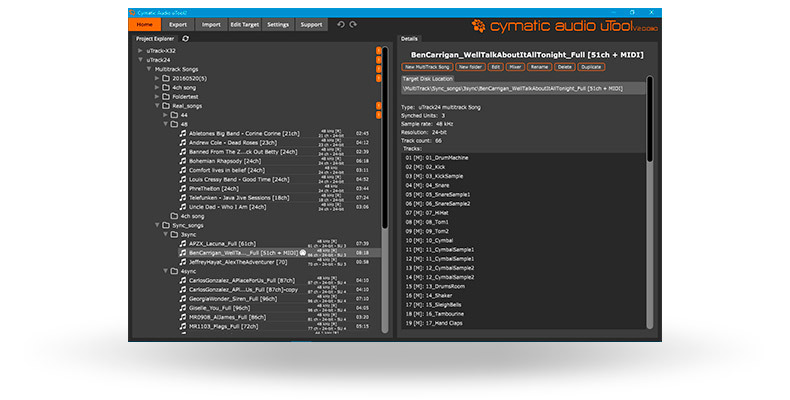 uTool is the Cymatic Audio utility software that lets you exchange audio data between your Cymatic Audio recorder/player and your computer, create and manage playlists, organize synchronization groups and much more. uTool is the indispensible companion to the Cymatic Audio players and recorders linking the worlds of hardware-based recording & playback together with your DAW. uTool does automatic conversion of audio data from and to computers for seamless data exchange between DAW and uTrack-X32, uTrack24 and LP-16, turning your unit into the ultimate live capture tool and multitrack player. Craft custom-made playlists with exisiting song projects. Various start modes available to trigger the start of the next song in a playlist. Prepare your set list and backing tracks offline, in advance, while monitoring through your computer’s sound output. Handy project & playlist management features such as duplicate projects, duplicate playlists, undo, redo etc.